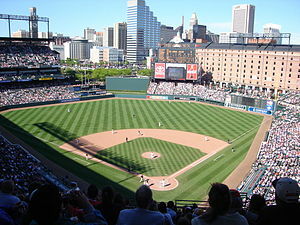 In addition to being new yet old, the stadium was smaller and built into Baltimore, not on the outskirts, to help with the revitalization of the city. And, at least to some extent, it has worked. Going to see the Yankees play in New York is extremely expensive. Fans can travel to Baltimore, stay in a hotel, go to a restaurant and attend the game for less money than New York tickets. It’s a lot more bang for your buck. It’s easy to walk to the ballpark from downtown and enjoy much of what the city has to offer—the Baltimore Aquarium, the Inner Harbor and the new, upscale Harbor East for starters. Having all the tourists in our city for baseball helps us in so many ways, and while Baltimore is more than The Wire, and while we have been getting better and better, we still need the help. However, as Camden Yards celebrates its 20-year anniversary, Miami’s new Marlin Parks may be the end of the Camden Yard era. It’s modern, futuristic, shiny and full of technology. It may be the new mold for ballparks of the future but for those of us who have enough technology every time we open our doors and who crave a little more tradition, we’ll enjoy Camden Yards and the many parks which came after. This past weekend was the Baltimore marathon. Thirty year old, Stephen Muange from Las Cruces, New Mexico took first place for the men with a time of 2:15:16. While thirty-four year old, Olena Shurkhno, from New York, New York, came in first for the women, with an event record breaking time of 2:29:11. This was Kenyan Muage’s first marathon. It was Olena Shurkhno’s second time winning the Baltimore Marathon. Approximately 25,000 runners participated this year, the largest turnout to date, about 14% more than last year. They ran through the zoo, past Under Armour and through the city. It’s estimated that the Baltimore marathon pumped $30 million into the economy. That might sound like a lot for a race, but consider that last year’s event had a $28 million impact—with less people. Forty percent of the runners were from out of town, that’s hotels, restaurants and, possibly, shopping or museums that benefit. Did you run the Baltimore marathon? Did you watch it? How did this year’s marathon compare to others?